Ambassador-at-large of the Kazakh Ministry of Foreign Affairs Stanislav Vassilenko proposed during a March 8 United Nations Security Council meeting on Afghanistan a three-pronged approach to bringing peace and stability to Afghanistan and announced plans to hold a conference devoted to women empowerment. The approach includes a) a security-development nexus, meaning that programmes for sustainable development would help achieve peace and security in the country, b) a regional approach to cross-border challenges and threats instead of the widely practiced narrow, country-specific focus and c) greater coordination between United Nations offices and programmes to improve efficiency and reduce fragmentation. Vassilenko said he believes the situation in Afghanistan has entered a crucial phase on several lines, including the ceasefire agreement, transitional confidence-building measures, upcoming elections, revising the nation’s constitution, possible release of Taliban members from prisons and their withdrawal from the sanction’s list. In this vein, “sustained support from the countries of the region, the international community, the UN and the Security Council, international, regional and sub-regional organisations is required,” he said. He also noted that a decision by Afghan President Ashraf Ghani to recognise the Taliban as a legitimate political group and offer it the opportunity to open an office in Kabul with no preconditions deserves “our most serious attention.” If the Taliban is to accept the deal, its members will have a right to legitimately reside in the country, with potential exclusion from the council’s sanctions list. In that same council meeting, its 15 members adopted Resolution 2405 (2018) on extending the mandate of the UN Assistance Mission in Afghanistan (UNAMA) through March 17, 2019. President of the Security Council for the month of March and Minister for Foreign Trade and Development Cooperation of the Netherlands Sigrid Kaag said, “Peace in Afghanistan can only be built through comprehensive negotiations and under the leadership of the Afghan people themselves.” The support of the international community, including partners and donors to the Afghan people, is indispensable, Kaag continued. The Secretary-General’s Special Representative and Head of the United Nations Assistance Mission in Afghanistan (UNAMA) Tadamichi Yamamoto also briefed participants on the latest developments in Afghanistan, including the launch of construction on the Turkmenistan-Afghanistan-Pakistan-India (TAPI) gas pipeline. Officials hope the pipeline will spur regional cooperation and the self-reliant economic development of Afghanistan. Parliamentary and local elections in 2018 and presidential one next year have also called UNAMA into action to activate women’s participation as voters and candidates, said Yamamoto. Yet, the relationship gridlock between President Ghani and one of the country’s political parties, Jamiat-e Islami (Islamic society), over sacking its representative from the leadership of Balkh province of Afghanistan is a new concern, said Yamamoto. Yamamoto stressed that UNAMA is cooperating with international partners and national defense forces to pressure, prior to the elections season, terrorist groups that impede peace and stability in the country. The visit of the council members to Kabul on January 13-15, organised during Kazakhstan’s presidency, has been noted as a positive sign of high-level support among international partners for the Afghan government and an illustration of regional partnership between Afghanistan and Central Asia in security and development. The council meeting also occurred on International Women’s Day and prominent female representatives of Afghanistan, Deputy Chairperson of Afghanistan’s High Peace Council Habibi Sarabi, and Executive Director of the Organisation for Policy Research and Development Studies Mariam Safi, gave presentations on the lives of Afghan women. They noted that the lives of women have been impacted by constitutional and legislative amendments and expressed concern over the increased number of women among refugees. A member of the Afghan delegation to the council also highlighted Afghanistan’s achievements in women’s empowerment, saying the government of National Unity is committed to enhancing the role of women in all spheres of Afghan society and that women are represented in ministerial, parliamentary and diplomatic positions. In turn, Vassilenko also voiced Kazakhstan’s support of the Afghan government’s efforts to improve gender equality and its adoption of the National Action Plan, which includes developing a policy to protect women in conflict, establish special courts to combat violence against women and implement the Law on the Elimination of Violence Against Women and UN Security Council Resolution 1325 on Women, Peace and Security. He also noted the mission to Kabul in January included meetings with women’s organisations led by First Lady of Afghanistan Rula Ghani, which provided insights into gender issues in Afghanistan. 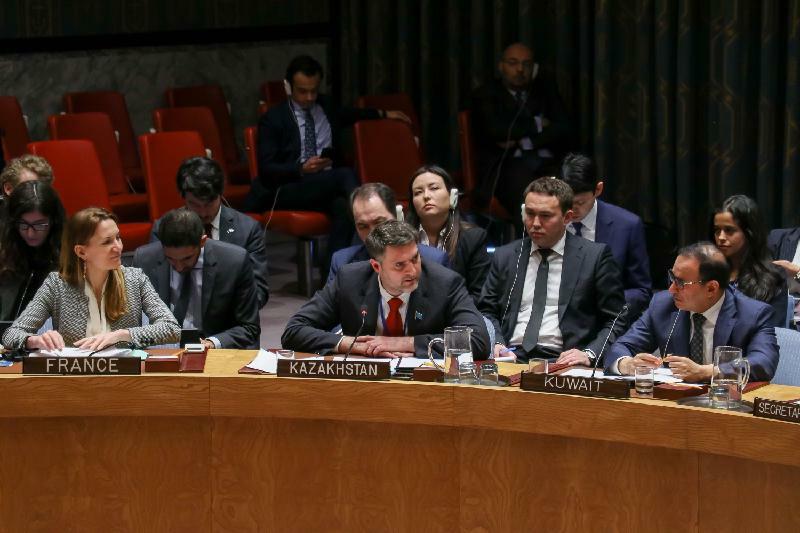 The Kazakh special envoy then announced Kazakhstan’s plans to organise an international conference in the fall to seek ways to empower Afghan women in the socio-economic and political spheres. He also informed that Kazakhstan has taken the initiative to continue its flagship $50 million education programme for Afghan citizens for 2010-2021, now with co-financing from the European Union and other partners. A total of 1,000 Afghan citizens will undergo training at Kazakh universities under the Kazakh programme, said Vassilenko. Additionally, a joint project to educate Afghan girls specifically at Kazakhstan’s higher education institutions to be co-funded by the EU and run in cooperation with the UN Women, is in the pipeline, noted the Kazakh envoy. Vassilenko also expressed concern over the spread of violence against women in Afghanistan, especially the deaths of women and children because of terrorist attacks and offensive airstrikes and called on participants to join efforts to reduce such casualties.